Recorded at Microsoft’s Future Decoded at ExCeL, London. 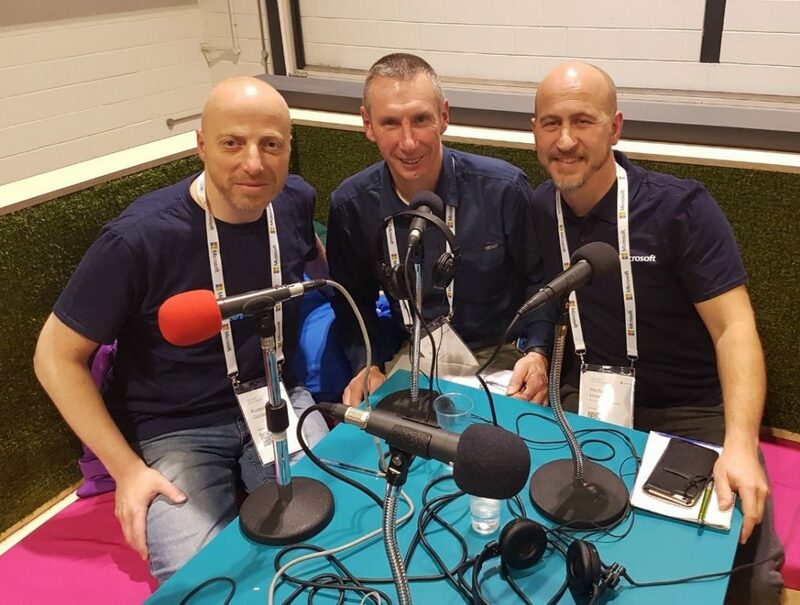 Show 55 was the second of three podcasts recorded in partnership with Microsoft from their fourth Future Decoded event in ExCel in London and this episode focussed on ‘Technology for Good’. 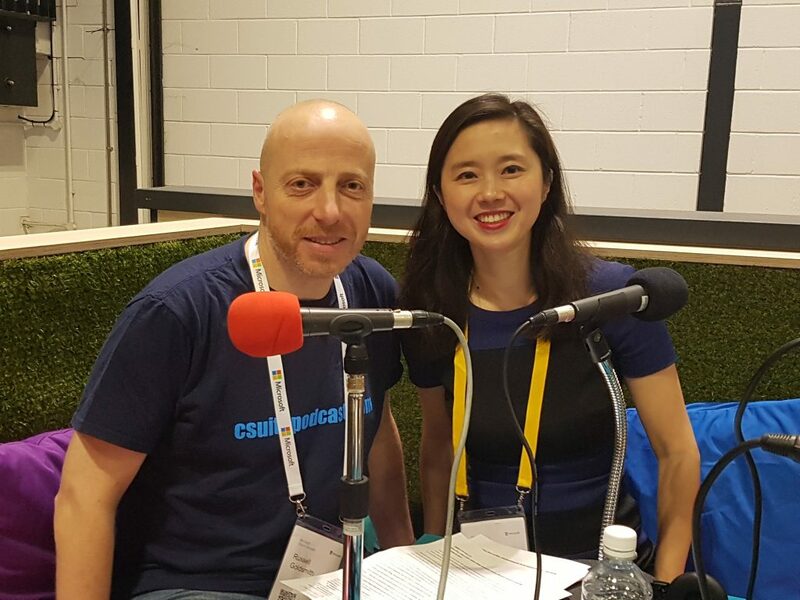 The first guest that our presenter, Russell Goldsmith, spoke to was Haiyan Zhang, Innovation Director at Microsoft Research Cambridge who had recently created a life-changing device to help people suffering from Parkinson’s Disease under the project name, Project Emma. Haiyan explained that Project Emma was named after Emma Lawton, a creative director and graphic designer who was diagnosed with Parkinson’s at the age of 28 and who therefore lost the ability to write and draw because of the tremors in her hands that are caused by the disease. Haiyan met Emma through the BBC2 show, ‘Big Life Fix’, which aired Christmas 2016, and they began working together to see if they could use technology to overcome her tremors and regain her writing ability. Haiyan said that through talking to Emma, she felt that something to do with vibration might be able to help her by distracting her brain from the tremors themselves. She therefore built a number of prototypes of a wearable device, like a watch strap, which vibrates at different frequencies and different patterns, that Emma can control using an app on her tablet device, and through these vibrations, Emma has now been able to hold a pen and write and draw again. This was specifically designed for Emma, however, each Parkinson’s sufferer may have individualised symptoms. Haiyan’s team are therefore now undertaking studies to see if this technology can work for other patients and so Project Emma is going to into further research with clinical researchers and neuroscientists at UCL, to take on a broader study. Haiyan and her team are also evolving the technology internally to make it easier to study the effects of the watch. There are other projects that Haiyan’s team are working on within Healthcare too. For example, her colleagues in Seattle are working on trapping mosquitos and using mosquito blood and analysis to track the outbreak of diseases across populated areas. In the Cambridge Research centre, her team are also working on number of initiatives. One example is Project Fizzyo, which is gamifying cystic fibrosis treatment. Sufferers of cystic fibrosis are born with the condition and undergo a daily regime of strenuous exercise to clear the mucus build up in their lungs. Haiyan said that she met a family in Cornwall where two teenage boys have cystic fibrosis and their mother spends hours every day, persuading them to do their physio exercise, which in the long run can save their lives, but in the short term, they find it hard to see the impact it has day to day. Haiyan’s team are therefore working to create new technology to attach to existing cystic fibrosis equipment, turning the exercises into video game controls, so that they can play a video game while actually doing the physio and undertaking the medical treatment. Finally, Haiyan was also excited about appearing in a new series of Big Life Fix in a Special Episode for BBC Children in Need, which is now available to view on BBCiPlayer, where she helps ten-year-old Aman with her severe memory loss. 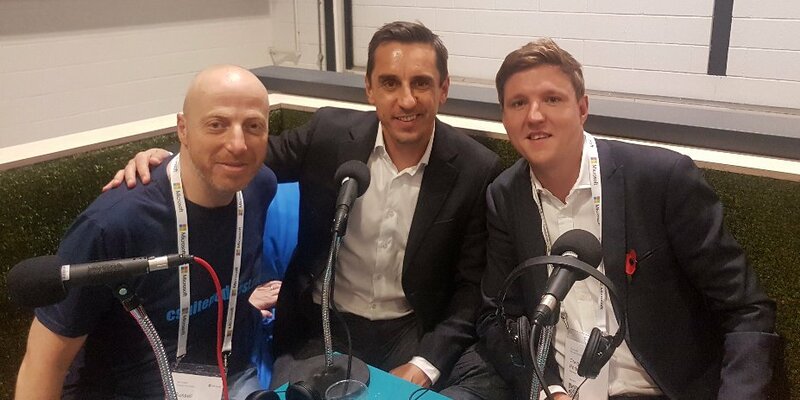 In the second part of the show, Russell was joined by Microsoft’s Education Partner Lead, Craig Parker and Former Manchester United and England Footballer, Gary Neville, the driving force behind University Academy 92 (UA92), a new University he is aiming to launch near Old Trafford, Greater Manchester, which he explained came about as a result of conversations a few years ago with Professor Amanda Broderick, who is now Chief Executive Officer of Newcastle University London but at the time was working at Salford University. From his list, Gary said that he started to think how that could become the heart of an education project, rather than it just being about getting the degree. He compared it to football in that, even if you have the skill, i.e., the football degree, it doesn’t mean you will make it as a Premier League player if you don’t have the character, personality and resilience. He therefore wanted to look at how he and Professor Broderick could create a curriculum/academic qualification that had embedded into it these life qualities that he had listed. With some seed investment, and Professor Broderick’s help, he then started to engage with Lancaster University, who Gary said loved the approach, plus they started speaking to corporate partners such as Microsoft, who they have now been working with for the last 12 months, co-designing the curricular with industry, rather than just looking at it from an academic perspective. Gary said that when he first walked into Microsoft’s offices, he felt it was an energetic, innovative and vibrant space and he immediately thought that it represented what UA92 is about, i.e., not conventional or traditional but instead, thinking ‘outside of the box’. He also felt that the cultures were aligned too. However, Craig was quick to point out that Microsoft are there to provide support in the best way they can and add value to, but that the project is clearly driven by Gary and the team at UA92. However, Microsoft are looking at what that support might grow into, for example in the form of apprenticeships. In terms of what students can expect when they enrol, first and foremost, Gary said that they have to have a credible degree, which of course is where Lancaster University come in, and with some credibility too, having been named University of the Year by The Times and Sunday Times Good University Guide 2018. Lancaster was also placed 6th in the national league table. Following that, Gary wants students to look at the prospects of employment – to expect to be able to get a really good job after they graduate that’s suitable and stimulates them every morning. He therefore feels that whilst many universities have work placements, the idea of UA92’s private/public or education/business partnership, where it is engrained from day one that you are studying for an industry led, high quality academic degree, will provide what businesses want in terms of people who are motivated, knowledgeable and have the same culture. It’s this that he hopes the students will strive for. UA92 aim to open their university doors in September 2019 and so student recruitment starts in 2018, but there is still a lot to do to ensure they can deliver the project. However, Gary is extremely excited in the fact it’s now a real project. He said that they have an ambition to impact as many people as possible with what they believe to be a compelling offer and so eventually that will mean growth into different areas, but for now, the aim is to establish this first university and make it a success. 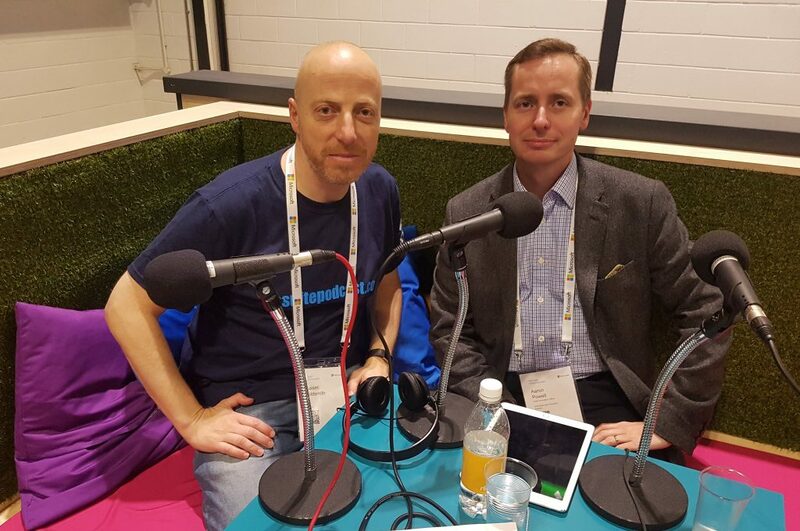 In the third interview of this episode from Future Decoded, Russell caught up with Aaron Powell, Chief Digital Officer at NHS Blood and Transplant. Aaron feels that technology is making a huge impact on the services offered by NHS Blood and Transplant. He said that it is helping to transform the way they save and improve patients’ lives, which he added is fundamentally what their mission is. Aaron explained that their job is to provide a safe and reliable supply of blood to hospitals in England and to manage the organ donation and transplantation system in the UK and that technology enables them to connect their services and process better as well as the data they hold. It also allows the personalisation of services that are offered to donors. Everything in this service relies on the generosity of donors, either blood or organ donors, yet still three people still die each day waiting for an organ transplant because there aren’t enough. He said that their job is to connect the information and ensure it is accurate and access can be gained as quickly as possible. They have to manage an efficient system, that enables them to attract and work with donors, so they use the power of Microsoft Azure to manage their appointment booking system, which allows them to make around 139,000 blood donation appointments each month. They also use Dynamics CRM to manage the transplant waiting list, which ensures the clinicians making decisions as to whether to accept an organ for transplant have the information that they need at their fingertips. He added that more and more of their systems are powered by the cloud, which he sees as the engine that drives a lot of their digital transformation, and enables them to pull their data together, and to then use that data intelligently to gain greater insight into how their donors behave but also into the health of patients and the efficiency of their own operations. Aaron said that they have faced some challenges in creating a culture of digital change. The first was to address the question of ‘What is this digital stuff?’. They therefore use words like connectiveness and personalisation, to explain the outcomes of what the digital technology enables. They then went on to speak about automation, better integration, whether that be data, processes or systems and then systems that support intelligence and decision making. However, from a cultural perspective, Aaron added that it feels as much about inspiring people, giving them a sense to think the unthinkable, and to think about how the organisation would be different if some of the barriers to that connectiveness were not there. Also having to deal with fears people have with new technology, like robots coming to take over our lives, having to explain to staff that technology will their make working lives better. Or call 0300 1232323 for either of the above. This was our second interview at Future Decoded with Hector and Andrew, having previously spoken to them on Show 54 about Firstline workers. However, this time we were discussing the topic of Accessibility, something that Hector is working on a blueprint for, involving governments, NGOs and charities. He explained that his role is to be the eyes, ears and voice of accessibility in Europe for Microsoft and said that we live in a time of digital transformation, so need to make sure we don’t leave people with disabilities behind. There is a real opportunity to realise the advantages that thinking around disabilities can bring to all businesses and organisations. His blueprint is for Governments with real aims and ambitions for disability and for businesses with drive, who wish to cater for customers with disabilities but also to employ people with disabilities and recognise the diversity and inclusion they bring. The other element of his blueprint is internal to Microsoft – how does the company present and talk on accessibility and how does anyone who is engaged with their products represent their core true values around empowering every person and every organisation on the planet to achieve more. Hector added that they need the support of all charities and the disability community to promote the technology that is available. Microsoft has had much success with blind and visually impaired tech as well as those with hearing loss around mobility issues – people with severe mobility issues can type an email using just eye movements – but they need people to know this. Andrew told us of some of the technologies being used for Firstline products, where technology needs to cover a broad spectrum and it is not just about typical disabilities that we might encounter. For example, he said that you may have an immigrant who is learning English but struggles to read it. He therefore wants to be able to help these people too. One of the technologies Andrew talked about was Windows Hello, which allows facial recognition to log in and authenticate yourself, bypassing the need for long and complicated passwords. Moving on to intelligent services, he also talked about the fact that PowerPoint allows you to choose the subtitle language you may need. He added that not many people know that Microsoft Office applications have a built-in accessibility checker, which will go through your whole document and offer guidance on what you should do and why, to make things accessible. Hector said that this opens the question of who is responsible for accessibility – in a cloud connected world should we all be authoring accessible content? Andrew says that it has been a journey to understand accessibility, however, people are not going to do it themselves but if you give them guidelines and the correct tools they can flourish. Hector pointed out then this goes back to HR and employment and that it can make it easier for them to make positive decisions about recognising the talent disabilities can bring to the organisation. We also discussed the fact that October 2017 marked the 70th anniversary of National Disability Awareness month saw the US, an event organised by the Office of Disability Employment Policy. The theme for this year was ‘Inclusion Drives Innovation’ and Jenny Lay-Flurrie, Microsoft’s Chief Accessibility Officer wrote a blog post on the topic and shared a video about positively hiring people with autism. Hector explained that Microsoft realised that the recruitment process automatically ruled out certain people. They proactively employ people with autism into Microsoft, but they had to change the recruitment process to allow this. Instead of a highly stressful interview they now use a workshop system, bringing people in for a week rather than an hour, which allows people to show their best selves. This program has led to some incredible talent into Microsoft and they now want to take the program global. Hectors view is that if you want to meet a problem solver, meet someone with a disability, they have spent their lives working out how to get through a situation. From Andrew the final message is simple – it takes a cultural change to make this happen, which hopefully starts at the top, by simply listening and talking to fellow workers. Then invest in diversity and inclusion workshops to change people’s attitudes. Finally, Hector pointed out that we need to recognise that 70% of disability is invisible. Therefore, allowing people to find tools quickly and easily, even without disclosing their disability, is a critical issue to get across. All previous shows of the series are available on this website as well as Soundcloud, iTunes, TuneIn and Stitcher. There is also a growing community on Facebook and Twitter, where you can get involved in the discussion. Finally, if you subscribe to the show, please can you give it a positive rating and review on iTunes in particular as this helps it up the charts!